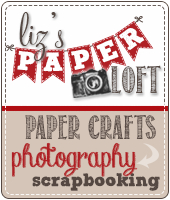 Liz's Paper Loft: My Guest Designer: Katie! 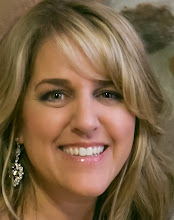 Hi, this is Katie from Crafting with Katie, and I am so honored to be Liz's guest designer today! She is an amazing crafter and a wonderful friend, and I hope she can get back to crafting her gorgeous creations soon! For my project, I made a little gift for my niece, who is in love with her puppy, Blua. I thought Liz would enjoy this too, since she has an adorable new addition to her own family! 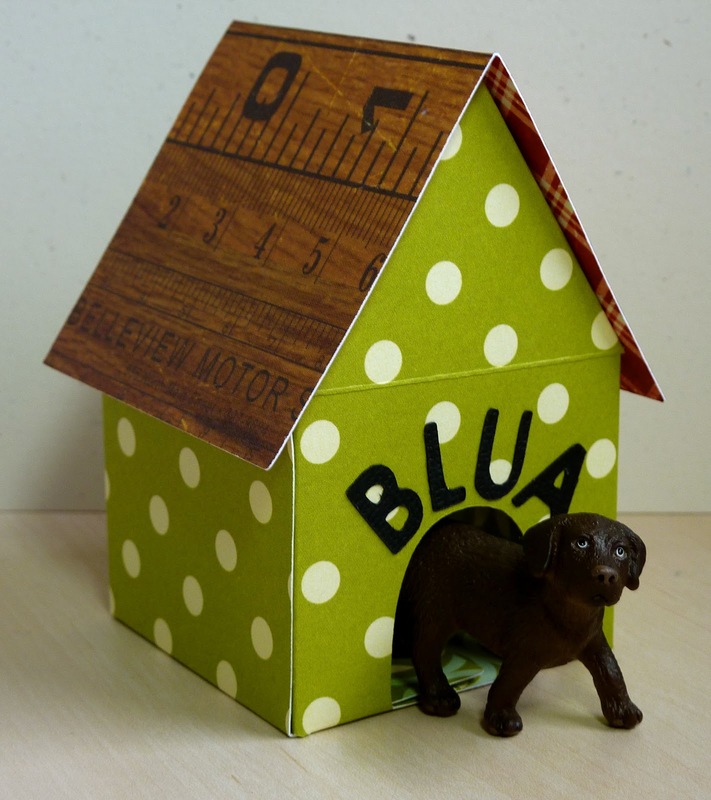 This doghouse was made with the new Cricut Tags Bags Boxes and More 2 cartridge. I just thought it was so cute, and it was fairly simple to put it together. I cut it at 5". The letters on the doghouse are cut at 1/2". For my card, I used an 8 1/2" x 5 1/2" rustic white card base, scored at 4 1/4". My polka dot layer is 4" x 5 1/4", and I added strips of red and ruler patterned paper to it before stitching around the edges. 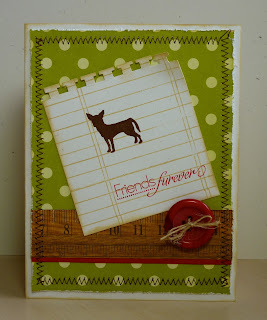 I then distressed the edges with my Tim Holtz Paper Distresser and adhered it to the card base. To make the note paper, I just cut a square of rustic white cardstock and edged it with the ekSuccess Binding Edge Punch. 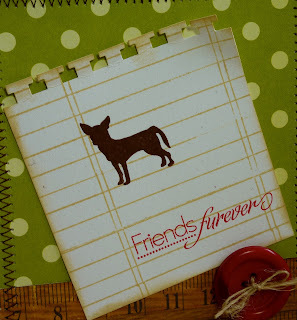 I added the lines with the Papertrey Ink Library Ledger stamp set, the dog from My Creative Time's Keepin' it Classy, and the sentiment from My Creative Time's Classy and Fabulous. A pretty button and some twine finished it off! Now, Liz has some exciting news to share with you, but not quite yet. However, in the meantime, while she's recovering, she is reading every comment! Not only is she reading them, but she's counting them too, because at the end of all of this she will have two big announcements! The first will be a winner of some exciting BLOG CANDY! The second, it's a big one... and no, she's not coming out with stamps... you'll just have to wait and see! Thank you Katie, for filling in for me! This is so DARLING!!! And very funny with the dog theme, but I know she is going to love it!!!! For those of you that don't know, Katie also just recently had surgery. 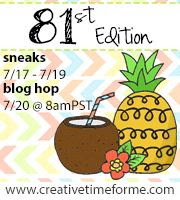 Make sure you head over to Katie's blog and shoe her som love too! Katie this is super cute!! I love the color of the paper you used!! Katie ~ There are so many details to this project that I just LOVE! Seriously LOVE! That ruler looks so real!!! Love how you used the dog from Emma's stamps! Your niece is just going to LOVE this! The sentiment is so true and PERFECT for this! 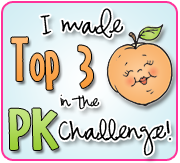 How fun you did something for your niece and how it fits into Liz's life too! GREAT JOB! Congrats to Liz and her family for the "NEW" addition! These are super cute! I love the little dog house! How CUTE!!! 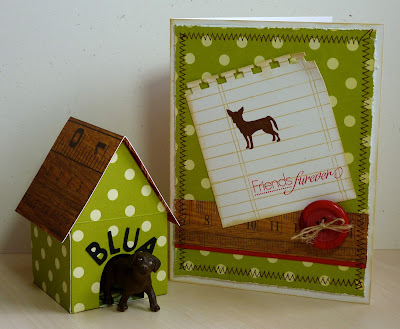 I just LOVE that little dog house! ADORABLE!!! I'm sure she will love it! Aww, how adorable and I know your neice will love it. I just love the polka dots! The dog house is just darling! Love the set! I just got the TBBM2 cartridge but haven't played with it yet...I'll have to break it out of the box...just too cute! Thanks for sharing and hope you BOTH are feeling better real soon! How precious is this dog house. Next on my list to get now is this new cartridge. My youngest daughter just was accepted to UT Vet School, and loves all animals, and I'm going to have to make her several of these. I always fine sewing on a card adds so much extra detail and dimension. Great job! That dog house is adorable!!!! 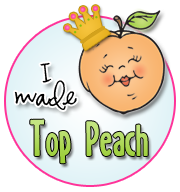 And your card is awesome, with the stitching and the cute stamped image! Love this! I love the dog house! This is great for all the dog lovers in your life! This is so adorable! What great paper and stitching! 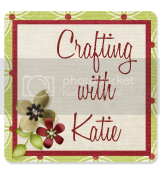 I enjoyed your guest designer Katies project. I have just bought the Bags, Tags and more cartridge so will be giving this a go. Hi Liz, I absolutely love this project that Katie made. I just got this cartridge, some of the projects look complicated. Thanks for the inspiration. What a wonderful gift--love the dog house. Great job Katie! Love the dog theme and the dog house! I hope you are continuing to recover nicely Liz! This is GREAT Katie!!! Awesome job!! Great projects! I just love that shade of green.